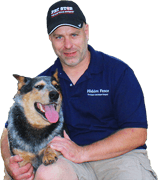 GentleSteps Fence Training by Hidden Fence, Inc. will teach your dog his new hidden fence, and it will do it without frightening or stressing him out. As the name implies, this training uses numerous tiny little steps of harmless static corrections that feel much like tickles. The tickles really do feel like tickles, and we encourage you to feel them for yourself. Fortunately, pet containment systems are not what they used to be and the days of using high-level corrections or leash jerks to teach pets new boundaries are gone. Our system is actually pet friendly! Rather than attempt to contain your dog with painful zaps, we use a unique gentle approach that has produced outstanding results – our training method is so effective that owners need to spend only 5-10 minutes, three times a day, during the five-day training phase, to teach pets their new boundaries. Dogs love the training because it is painless, fun, upbeat, and comes with lots of tasty treats! Using these mild tickles, we will be teaching your dog to back up from the flags. You may notice your dog slightly cocking his head to the side, perking his ears up, or scratching his neck, but what you won’t see is yelping or crying – most dogs show no sign of discomfort or stress, and many actually enjoy the training. Your dog will soon learn how to back up on his own. There’s no guesswork, and no timetable. Your dog will be telling us what level they need and when they need that level. Dogs are like people, every dog is different. We will progress at the dog’s pace. That being said, most dogs are trained to the fence in less than 2 weeks. Contact us today to learn more about our GentleSteps™ training. Hidden Fence Inc. is proud to carry Pet Stop® brand electronic pet fencing products! When it comes to the health and happiness of your beloved pet, we don’t outsource – all of our underground pet fence systems are made right here in America and are constructed of quality, durable materials. Not only are our products guaranteed to last a long time, but they’re also safe and humane, providing effective dog containment without the use of painful zaps.